I am not ashamed to say that I would pick a night in rather than going out, I would even go as far to state that it's the new 'night out'. If planned properly you could have an amazing night in. There are a number of things I like to do if I'm spending my night at home. I think when you are spending the night at home the most important thing is to be comfortable rather than looking presentable. I love to either be wearing tracksuit bottoms with a loose jumper or pyjamas, my favourite at the moment are a Primark pair which I was gifted at Christmas and I just adore them. If I am deciding that I want to spend the night in I will always make sure I have something to watch. At the moment I'm on series four of Prison Break . If I am not watching that I will pay a movie or watch some Youtube videos. Some of my favourite movies are Love, Rosie or anything Nicholas Sparks related. I also love to catch up out my social media sites whenever I have time so I will browse my Instagram feed, Pinterest, Twitter and Facebook. Listening to music is something I love to do when I want to relax or improve my mood. I have been loving Troye Sivan's album especially YOUTH and FOOLS. No evening would be made without some type of food. I am quite a fussy eater but know what I love. If it was a Friday evening I would definitely order some type of take away whether that be Chinese or Fish & Chips. I also like to have a bar of chocolate on hand as no night is perfect without one. My favourite snacks are mini eggs, Salt & Vinegar crisps and chocolate chip cookies from M&S. No night in is complete without giving yourself a little pamper, whether it treating your skin or trying out a new beauty look. I love to a little more care with my skincare when I have some time to do it. I usually include a exfoliator and face mask into my routine when I have spare time on my hands. I tend to use Soap and Glory's pore face mask. I also love to take the time to indulge in a bath and use some of my Lush products, either a bath bomb or bubble bar. I have recently been using bath salts as well but I not totally sold on the benefits they are meant to live up to. Burning a candle can be another great way to have the perfect night in. 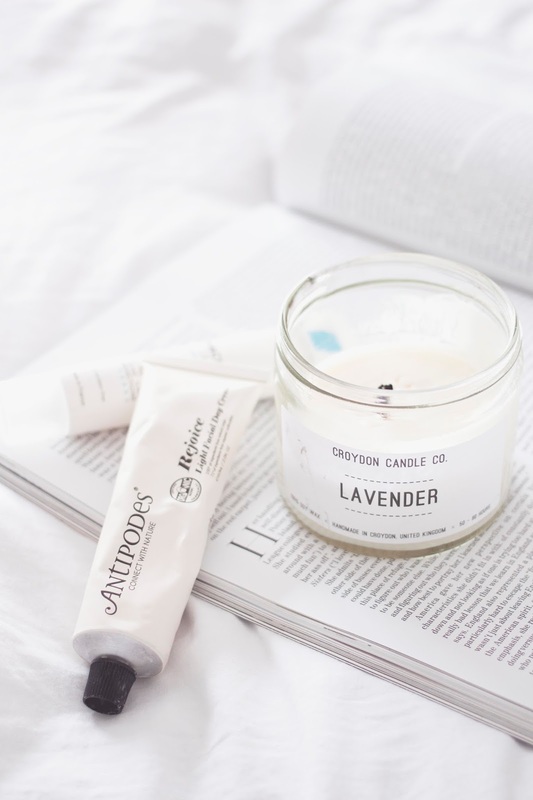 I haven recently been burning Croydon Candle Co's Lavender scent which is perfect for relaxing. How do you have your perfect night in ?